Margaret Thatcher Archive Trust has released doodles made by Ronald Reagan at the 1981 Ottawa G7 summit, which were then kept by the former British prime minister. Ronald Reagan’s scribblings, which include a man’s torso and an eye, are among personal papers from 1981 of Margaret Thatcher. 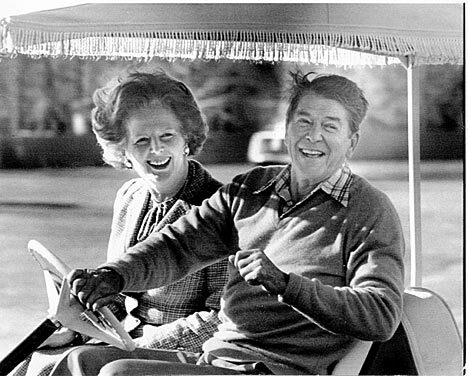 The Ottawa summit, which took place six months after Ronald Reagan took office, saw the leaders’ relationship progress to first-name terms – Ron and Margaret. Ronald Reagan was president for eight of Margaret Thatcher’s 11 years in power. The doodles, which were left on the table beside Margaret Thatcher and which she then filed in the flat at Number 10, have been released by the Margaret Thatcher Archive Trust. Margaret Thatcher and Ronald Reagan are first thought to have met in 1975 – four years before Margaret Thatcher became prime minister – when she was a junior minister in Edward Heath’s government and Ronald Reagan, the former governor of California, was on a visit to Whitehall. Remembering their first meeting, Ronald Reagan said even then he had believed she would make a “magnificent prime minister”. After Ronald Reagan took office in January 1981 – and in a sign of the close relationship to come – Margaret Thatcher was given of the honor of being the first foreign leader invited to the US by the Reagan administration. Margaret Thatcher visited the US in February 1981. The two leaders famously forged a close, though often tempestuous, relationship during their time in power. Both political outsiders, they found common currency in shared right-wing ideals such as minimal government, strong defense and a free market. There was also a joint mission to defeat communism in the shape of the Soviet Union. Political soul mates they might have been, but there were disagreements, most notably over the Falklands crisis in 1982 and then the US invasion of Grenada 18 months later. In her eulogy at President Ronald Reagan’s funeral in 2004, Lady Margaret Thatcher called him one of her “closest political and dearest personal friends”, while in later life President Reagan told how “richly blessed” he had been for having known the “Iron Lady”.